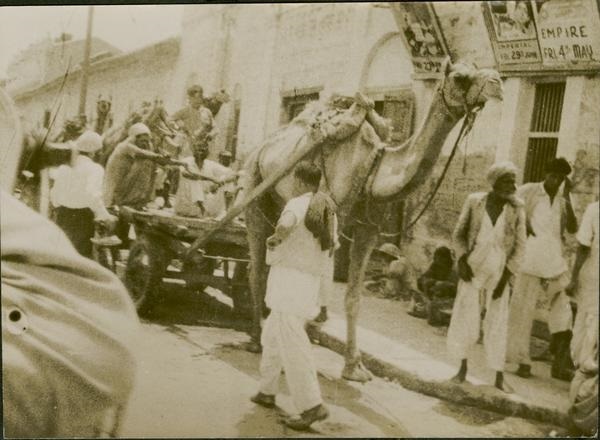 Throughout history, humans have interacted with animals of all kinds on a daily basis. Whether it’s our beloved cat or dog at home, or a squirrel running among the trees of Dunn’s Woods, their antics captivate us, and many times we find ourselves taking photos or videos and sharing them with our friends. Animals fascinate us, and our interactions with them help us learn and develop as humans. They provide entertainment, help with work impossible for humans to carry out alone, and aid us in research. 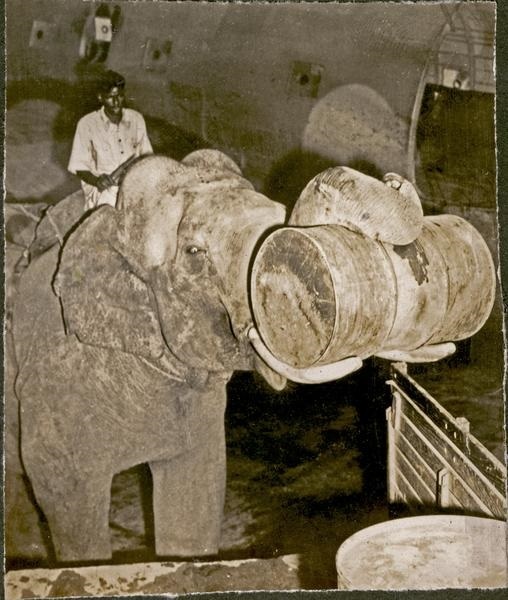 The Indiana University Archives is filled with a rich, diverse collection of photos highlighting our interactions with animals, whether it be for research, for work purposes, or for our general amusement. These photos are just a small sample, but they offer a glimpse into our interactions with animals. Animals provide humans with invaluable information through our observations of their behaviors and genetic makeups. 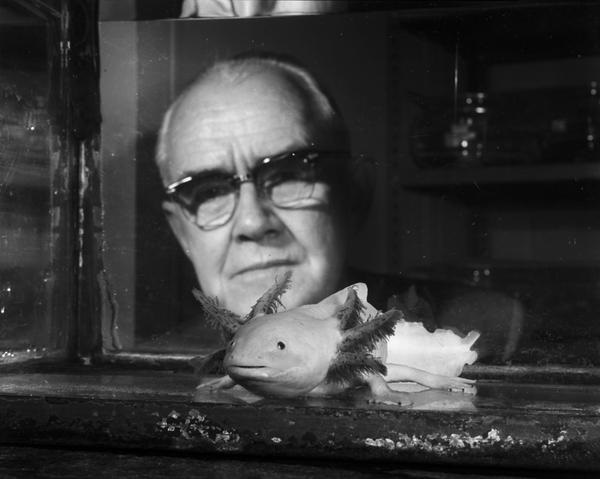 Beginning in 1957, I.U.’s Department of Biology hosted a breeding colony for axolotls, a member of the salamander family also known as the Mexican walking fish. The colony supplied embryos, larvae and adults to classrooms and to labs for genetic research, specifically for their regeneration ability. The colony remained at I.U. until 2005, when it was moved to the University of Kentucky. Scientific research helps us understand how a species has evolved over time. 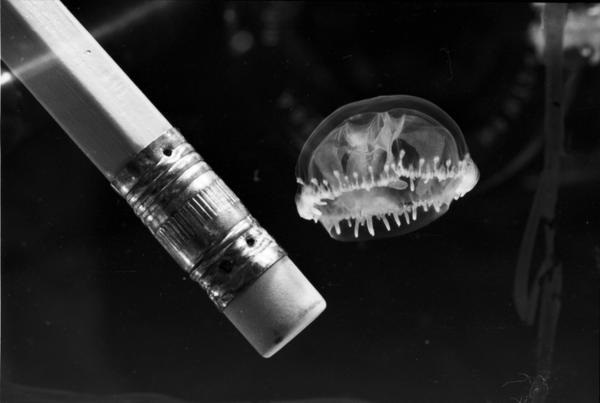 This Hoosier jellyfish, a member of the only freshwater species of jellyfish, was found in a flooded quarry near Bloomington in 1959, and used by an I.U. graduate student studying the evolution and distribution of the species. For most of us though, animals above all provide a sense of entertainment. We become obsessed with them, and we are quick to share with our friends our interactions with them. Even stuffed animals can provide a sense of fun, as evidenced by the photo of I.U. President and Chancellor Herman B Wells riding a stuffed horse in South Dakota around 1927. 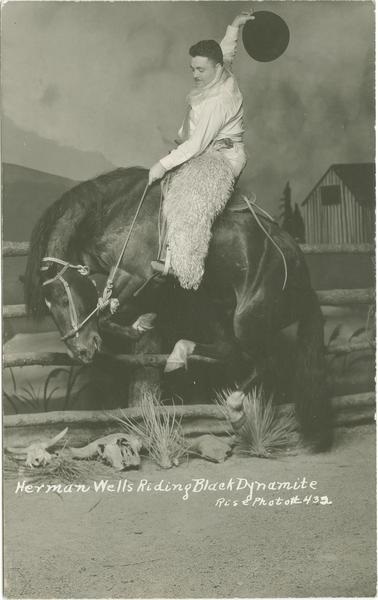 Wells, resplendent in furry chaps, was captured riding “Black Dynamite” about three years before his arrival at IU. IU athletics, while lacking an official mascot, experimented for a brief time with mascot ideas. 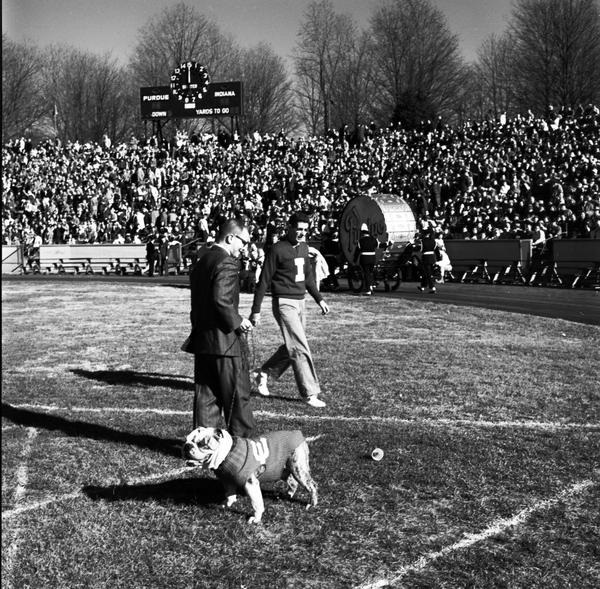 Ox the Bulldog, shown here before the Old Oaken Bucket game against Purdue in 1959, served as the mascot for I.U. football from 1959 to the mid-1960s. 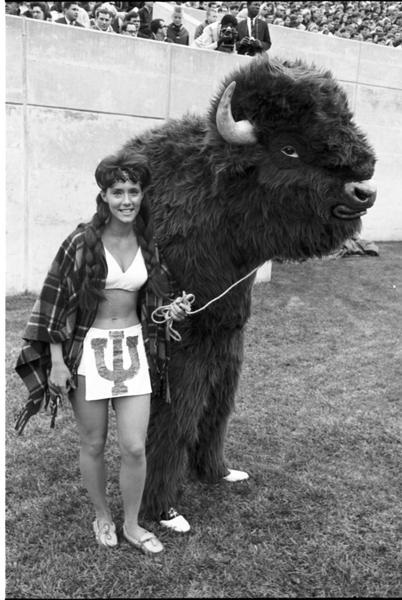 Later in the decade, the football team attempted using a stuffed bison as its mascot, but this also proved to be short-lived. Whether we interact with them for entertainment, work, or for research, animals help us conduct our daily business, and at the end of the day make us smile, and give us a reason to take a photo and share.